As promised, here is the first recipe in my ‘Slice Extravaganza’ series – the brainchild of my mother, who must be acknowledge for her great generosity in lending me the Family Recipe Book from which this recipe is taken. Thanks, Mum! 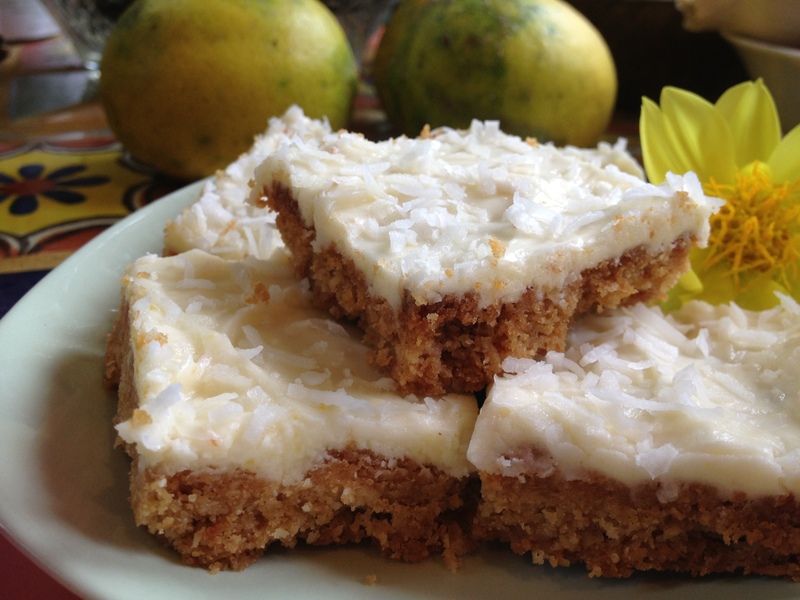 This is a delightful slice – a crispy, crunchy but delicate base with a tangy lemon topping. Perfect with a morning coffee or an afternoon cup of tea. It’s also a confidence-building recipe for kitchen beginners and young cooks. *Note – for vegans, use a vegetable butter substitute. If you’re gluten intolerant, this works fine with a commercial gluten-free flour mix. Preheat oven to moderate (160 degree celcius fan-forced or 180 degree oven – 350 degrees fahrenheit). Line a 28cm x 18cm (9 inch by 13 inch) slice tin with some baking paper. Measure the dry ingredients into a large bowl and then mix through the melted butter. 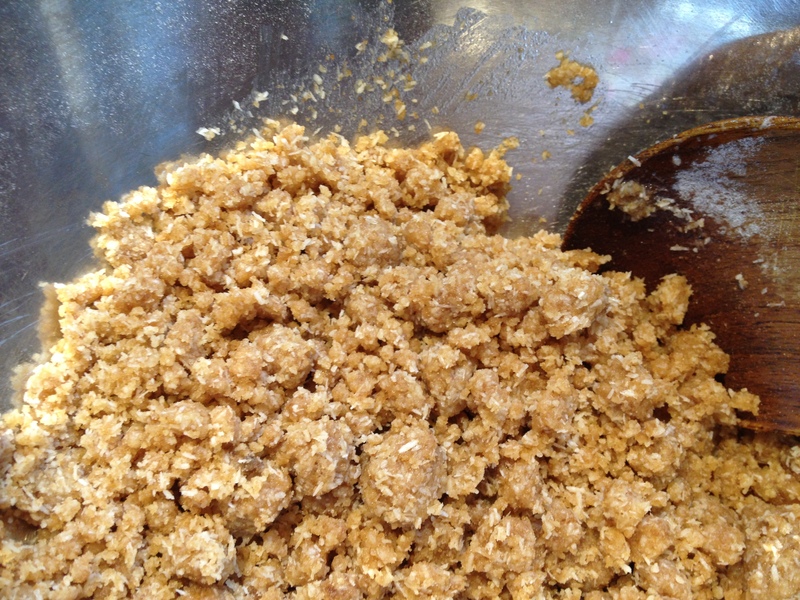 The mixture should be moist and crumbly. Press the mixture lightly into the tin. DO NOT PRESS DOWN HEAVILY! Place your slice into the oven and bake for 20 minutes, until the top is a nice golden brown colour. 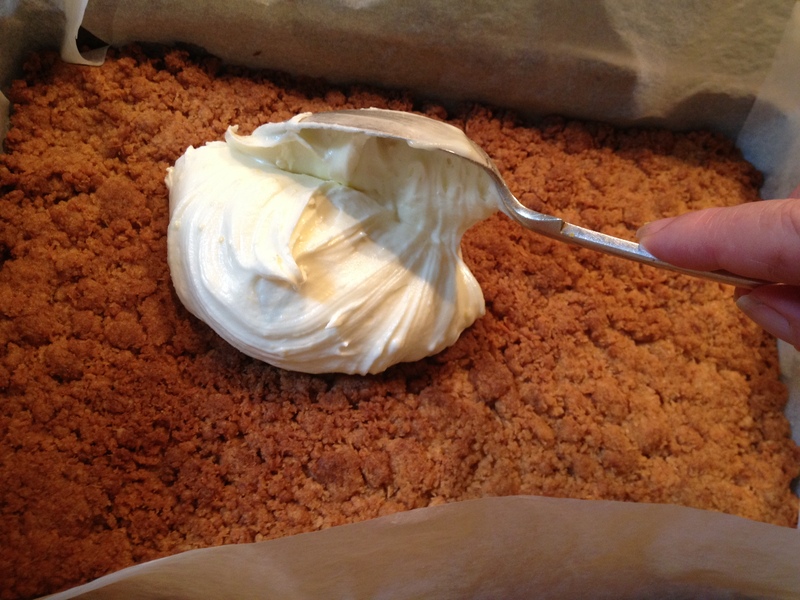 Mix the ingredients together with enough of the lemon juice to make a smooth, creamy consistency. Spread the icing mixture over the slice while it is still warm. 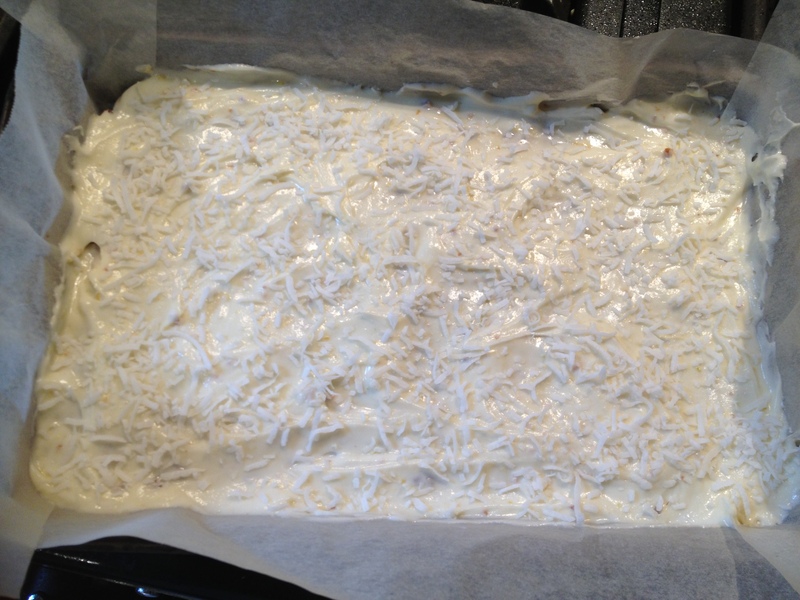 Sprinkle coconut over the warm icing and leave to cool in tin. 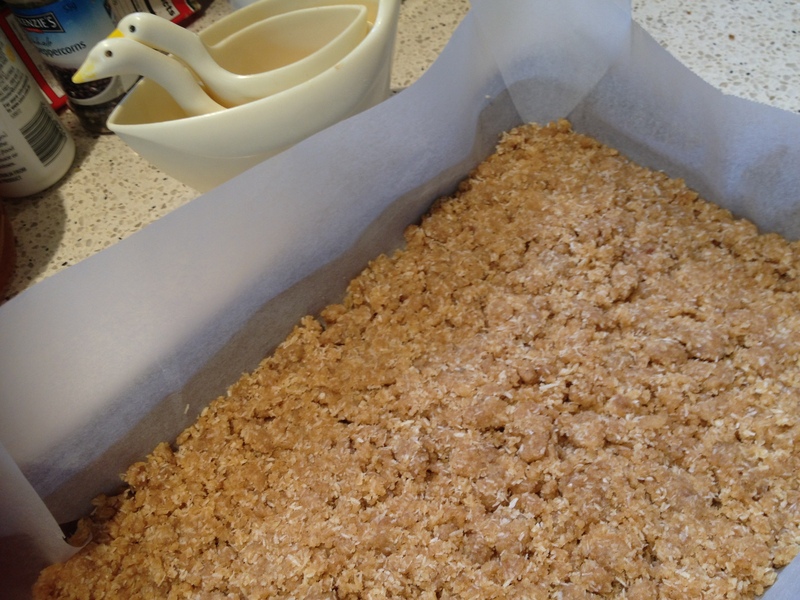 DO resist cutting before it cools, or you will end up with a crumbly mess! Cut into squares to serve, and store in an airtight container. I’m sure you’ll agree, it’s delicious! 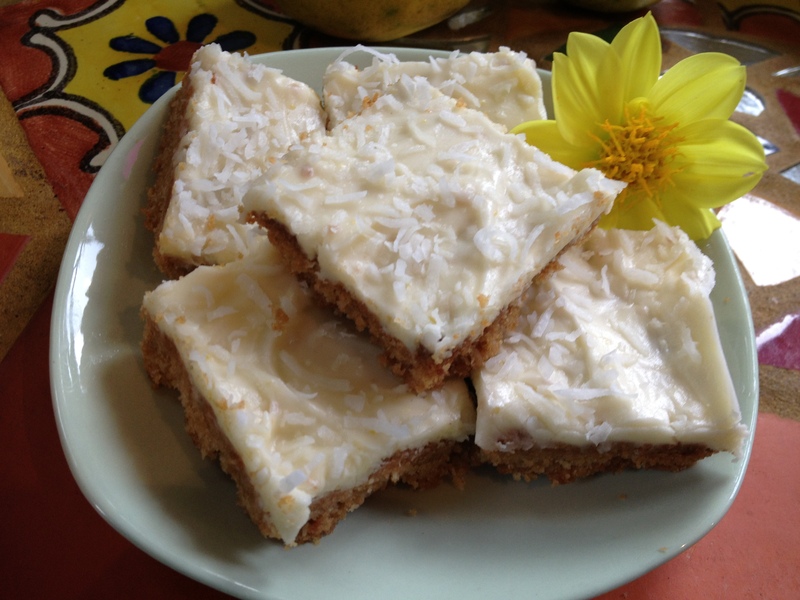 This entry was posted in Cakes and desserts, Gluten-free, Vegetarian/Vegan and tagged country cooking, easy slice recipe, family recipes, gluten free baking, lemon baking recipe, lemon biscuit recipe, lemon slice recipe, vegan baking, vegan dessert by Cauldrons and Cupcakes. Bookmark the permalink. Thank you Nicole, I have been waiting for this recipe ever since you wrote about it. I didn’t expect it to be so easy to make. I will be using gluten free flour and I don’t see where there would be a problem converting this recipe. I will let you know how it turns out. Yummy!! If I were to add some oats into the base would I need to add more wet? Or just swap out some flour? Thank you. I will do so. can’t wait to try it. You’ll be able to tell if it’s too wet or too dry. If it’s too dry it won’t press together, and if it’s too wet it will be greasy/tacky and stick to everything. It’s the sort of recipe you can fiddle with quite easily. I’m sure you’ll work it out! Love it! And thanks for the tip about self-raising flour.